By reading autobiographies of Mahatma Gandhi and Adolf Hitler one only highlights the glaring contrast between the two books as well as the two personalities. Gandhi was the personification of kindness and humanity. Hitler was a living monster. Gandhi achieved the exemplary feat of freeing this sub-continent from the mighty British Empire through peaceful means while Hitler became the cause of killing more than fifty lacks innocent men, women and children. The famous idiom says that the sun never sat down in the British Empire. The 'naked fakir' shook the mightiest empire of his day by fasting and praying. Gandhi loved humanity. He encouraged women and girls to fully realize their potential. He fought relentlessly for the cause of dalits and all forsaken people. His name evokes deep respect, love and devotion in countless hearts all over the world. Hitler's name universally evokes repulsion and fear. The dictionary does not have such cruel words as may describe Hitler correctly. He was a psychopath. He was a maniac. He was perverse. He was a murderer. Yet all these words are insufficient to describe the devilishness of Adolf Hitler. The model is open for humanity. If humanity and human race have to survive, Gandhi's path becomes inevitable. There is no alternative to kindness, co-operation and co-existence. Hitler’s model will only lead to destruction and further destruction. Gandhi even triumphed in his death. Robert Payne says, "For Gandhi this death was a triumph. He died as the kings do, felled at the height of their powers." Socrates, Jesus Christ, Abraham Lincoln, Mahatma Gandhi -many great people have martyred. But their ideas and their spirit never die. When we try to answer the question as to how one human being can be a Mahatma like Gandhi and the other a monster like Hitler, we have to analyze nature of psychological diseases as well as the importance of cultural and domestic background in building an individual's personality. We have to understand that both Gandhi and Hitler were products of their separate cultures. Only India and her pious spirit could have produced a Mahatma like Gandhi. The role of Gandhi's mother in giving human values to him was paramount. Gandhi did not witness anything like domestic violence as a child. His mind rested on a firm footage. Like all Indians, he did not have to bother about domestic shelter and security. A strong family makes a strong person. The Indian atmosphere is soaked in religious spirit. It was more so in Gandhi's times. Religion was another building block of the Mahatma's personality; India is the other name of absorbing inputs from all sides. Elasticity and flexibility are the prominent features of the Indian spirit. Gandhi completely embodied this spirit. Gandhiji's greatness as an individual lies in his persistence of his views. His greatness lies in the fact that he never abandoned his ideas. He once said that if evil is so firm in its evil ways, why should we leave our goodness; we have the better thing with us. Hitler was a direct product of a civilization based on aggression. His parents bitterly fought with each other. He had no mental rest and security as a child. Both in artistic and academic fields, he failed bitterly. He belonged to a culture that accepted violence as a valid tool to bring social change. We may also point out that Hilter had schizophrenic genes. History played a key role in the lives of these two individuals. One tends to believe in fate as one goes through the lives of these two individuals. Situations provided a rich opportunity to Gandhi to experiment with his ideas. Situations also provided an open path to Adolf Hitler to grasp military and political power in Germany. Things happened because they had to happen. 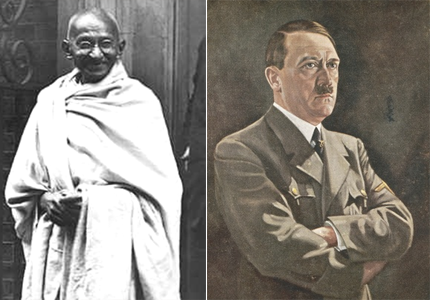 The major contrast between the Mahatma and Hitler comes from their style of demanding. Gandhi demanded truth through peaceful means. The only person that he punished was he himself with his fasting. Gandhi propagated peaceful disobedience. His method was to underline the correct thing. The result of his methods was that the opponents understood the justification of his demands. His whole idea was based on the goodness of human nature. He evoked and appealed to the goodness of his opponents. He believed that no person is his personal opponent. The wrong thinking and the wrong practices of the opponent were his enemies. Therefore, he targeted the actual enemy and not any person. His fight was against colonialism, poverty, ignorance, evil practices, discrimination, social inequality, dictatorship and so on and so forth. The British were not his enemies; their colonial rule was his enemy. So the whole technique centers around appealing to the good side of a human being, so that she or he herself or himself accepts the faults, withdraws from wrong doing and comes on the proper track. Gandhiji did not want to hurt even a single British; he only wanted them to leave India. The method of Adolf Hitler was totally contradictory to that of Gandhi. He believed that he had a right to kill people. He thought that he had many enemies in this world. He could not accept people who were different from himself. He made imaginary opponents and then killed them. This is the basic difference between the Mahatma and Hitler. The second most glaring difference comes in the form of humanity versus racial purity. Gandhi respected all religious. He respected all races on earth. He wanted to grasp good points of all countries and people. He did not believe in sections of humanity. He believed in humanity itself. He did not believe that one race was superior to the other or one caste was superior to the other. He lived with untouchables, ate with them, played with them, cried and laughed with them. He wanted to identify with the weakest of the weak. His oft quoted lines are that policy makers of India should keep the poorest person in mind when they form and implement policies. Hitler on the other hand believed in racial superiority of the Aryan race. His mind was full of non- sense. He believed that all evil in this world comes from the Jews. He believed that the blood of the Jews impure. He thought that weak people had no right to live; they must be killed. We can see that he wanted to identify with the strongest of the strong. Moreover his notions of strength were false. Jews were economically strong at that time. They were aiding to the economy. Why did he call them weak? There is no answer. The only answer is that he had false and whimsical ideas. Today after more than 60 years of this villain's death, we can say that the Jews have won and Hitler has lost. So many Jews have survived. Not only that, they have a strong and prosperous country like Israel. The most quoted living intellectuals of our times have been Jews. Nom Chomsky is a Jew. Jews are doing so well, especially in the areas of intellectual pursuits. Gandhiji believed in democracy. Hitler believed in dictatorship. Hitler did not want to give voting rights to the masses. He believed in a totalitarian and authoritarian government controlled by a dictator. Gandhi's life is an open book. Gandhi lived a totally public life. He had no secrets. He had no fear of being exposed. Hitler on the other hand had an insane passion for secrecy. He massacred people but never gave a clear-cut written order. He formed an inner coterie of similar minded psychopaths like Rudolf Hess, Koncrad Henlain, Franz, Halder, the cruel shooter Heinrich Himmler, Joseph Goebbels, Hermann Goring, and Hans F.K. Ginther. These people talked among themselves and maintained utmost secrecy. While Gandhiji had no fear, Hitler had all the fears in the world chasing him. Gandhi believed in the rights and dignity of women. He fully believed in the dignity of labor. On every possible account, there is a terrible contrast between the Mahatma and the villain. A famous historian describes Hitler "Adolf Hitler, 1889 1945 was the sociopathic leader (Fuhrer) of the Third Reich who was instrumental in establishing a totalitarian dictatorship, institutionalizing racism, and mobilizing the German people for war and conquest. Between 1933 and 1939 Hitler was able to pull Germany out of the economic depression through government deficit spending, extensive public works projects, and massive rearmament. Through the use of sophisticated government propaganda, which involved the skillful manipulation of mass opinion and mass emotions, Hitler immersed the German people in a collective fantasy that they could overcome any obstacle, no matter how staggering, and become the greatest power in the world. He promoted the idea that the Germanic (Aryan) race, being at the apex of biological evolution, was destined to govern the world; but to do so, it had to undergo internal racial purification, involving sterilization of the unfit, euthanasia of "lives not worth living," and elimination of inferior races, chiefly the Jews. In Hitler's mind, the concept of race was intimately linked to the concept of space because a people's greatness depended upon sufficient living space (Lebensraum). As long as sixty-five million Germans were limited to a small geographic space, they would remain small and insignificant. He promised to change this situation by rearming the German people and providing living space for them in Eastern Europe. In order to make Germany a world power, it was necessary to mobilize its entire resources and to promote in the German people aggressive and warlike tendencies. For this reason, Hitler wanted to breed a hard and callous youth that would delight in war and conquest. The aim of National Socialism, he insisted, should be to teach all Germans to be brutal with a good conscience. Between 1933 and 1939, his volatile, unstable, and sociopathic personality dominated European diplomacy, for he was able to manipulate the war-weary Western democracies into dismantling the Versailles settlement. At first, he pretended to speak as a man of peace and as a statesman whose nation had been tragically wronged by the Versailles Treaty. Appealing to the latent guilt feelings of the Western powers, he cleverly used the rhetoric of Wilsononian idealism against them by giving the world the impression that he, too, stood for national self-determination and a just and lasting peace. Secretly, however, he was preparing the way for conscription, rearmament, and war. One brilliant success after another, giving Hitler an aura of invincibility, followed: the reoccupation of the Rhineland (March 7, 1936), the annexation (Anschluss) of Austria (March 13, 1938), the annexation of the Sudetenland (September 29, 1938), the destruction of Czechoslovakia and its conversion into a German "protectorate" (Bohemia-Moravia, March 15, 1939), and the incorporation of Memel into the Reich (March 23, 1939). By the spring of 1939, it has become obvious that Hitler was insatiable and that his goals went far beyond national self-determination, for Czechs were not Germans and swallowing up a foreign state was not national self-determination. Yet, regarding himself as the greatest German of all times, his ego inflated to the point of megalomania, Hitler continued to push his aggressive agenda, this time demanding the Polish Corridor and the city of Danzing from Poland as a prelude to his ultimate aim-the conquest of Poland and Russia. In order to forestall having to fight a two-front war and still dismember Poland, Hitler allied himself with his archenemy, the Soviet Union, and signed a Nazi-Soviet Nonaggression Pact on August 23, 1939. One week later, he attacked Poland. Honoring their commitment to Poland, Britain and France declared war on Germany two days later. World War II had begun. Hitler saw himself waging two world wars: a conventional military war and a biological war aimed at exterminating Germany's greatest enemy, the Jewish race. Between 1939 and 1942 his armies, relying on blitzkrieg (lightning war) tactics, appeared invincible on all fronts. Poland was defeated in three weeks and destroyed as an independent state by Germany and Russia. After a period known as the phony war or Sitzkrieg (sitting war), Hitler resumed his conquests in April 1940, invading and defeating Denmark and Norway in rapid succession. On May 10, he attacked the Western powers; in one month he defeated Holland, Belgium, and France and drove the British expeditionary force from the Continent. By the summer of 1940 he was lord and master of the continent, but the British continued to hold out stubbornly and could not be subdued either by air or sea. After being side-tracked into conquering the Balkans and parts of North Africa as a result of Mussolini's military failures, Hitler committed his greatest and most fatal strategic error. In order to fulfill his racial utopia, which required the defeat of what he regarded as a Boleshevized and Jew-infested Russia, Hitler invaded the Soviet Union on June 22, 1941. On December 11, 1941, following the Japanese attack on Pearl Harbor, he also declared war on the United States. Hitler was now at war with the major powers of the world: the British Empire, the United States, and Russia, a war of attrition that could not be sustained by the limited resources and manpower at his command. For the next three and a half years, Hitler would wage war on five fronts: the home front, the air, the high seas, the eastern front, and the western front. Over seven million German and associated troops were stationed on far-flung fronts from Scandinavia in the north to the suburbs of Leningrad and Moscow, the Ukraine, and the Crimea in the east; to Holland, Belgium, and France in the west; to Italy and the Balkans in the southeast; and to North Africa and the Atlantic Ocean. At the same time, Hitler's brutal occupation of conquered people and territories, combined with his bestial extermination policies of "inferior races"- Jews, Gypsies, "Asiatic inferiors" – truned his empire into a charnel house and caused a savage backlash against Germany. His crowning achievement, what his henchman Heinrich Himmler called "a glorious page" in German history, was the extermination by poisonous gas of over five million Jews in annihilation camps in Poland (Auschwitz, Bellzee, Chelmno, Maidanek, Sobibor, Treblinka). With his cities pulverized by air and his armies in retreat on all fronts, Hitler increasingly withdrew from reality into vengeful recrimination, psychosomatic illnesses, and drug dependency. In January 1945, he went underground, directing the war from the safety of his bunker fifty feet under the Reich chancellery. When the Russians mounted their final attack on Berlin, closing in on the chancellery itself, Hitler made out his last will and testament, in which he blamed the Jews for everything and exhorted the Germans to keep the blood pure; he then married his mistress, Eva Braun, and committed suicide along with his new bride on April 30, 1945." When Hitler died, the world heaved a sigh of relief. Everybody thought that the monster came to an end. His death was celebrated all over the world as a victory of humanity. He is the most hated name in history of mankind. His name is used as an abuse for authoritarian, egotistical people. Even an uneducated commoner knows that Hitler means cruelty. One can listen even to a laborer on an Indian roadside saying, "Hitler Shahi Nahin Chalegi" (Hitlerism will not work). This is what Hitler has gained by his cruel ways. Let us now have glance at Gandhi's life. Mohandas Karamchand Gandhi, the great Indian political leader and social reformer, was born in 1869 at Probandar in western India. In 1888 he went to London to study law, qualifying in 1891; there he first encountered liberal and Christian ideas, and the teachings of Tolstoy. Returning to India, he practised law there until 1893 when he left for South Africa. His experience of racialism in South Africa led him to take up the rights of the Indian community and he soon emerged as their leader. He instituted a campaign of passive resistance in response to the Transvaal government's discriminatory policy, coining the term Saytagraha- truth force – for this new revolutionary technique. This method of resistance was later used to great effect in India's struggle for independence. Gandhi returned to India in 1915 and in 1925 he became President of the Indian National Congress. His first major clash with the British government came in 1919 over the Rowlatt Act, and he then introduced the hartal, a strike during which the people devoted themselves to prayer and fasting. However, when his policies resulted in violence he abandoned the program of mass civil disobedience. For a period Gandhi withdrew from politics and travelled throughout India preaching the cardinal tenets of his doctrine; Hindu-Moslem unity, the abolition of untouchability, and the promotion of hand spinning. He adopted the peasant's homespun cotton dhoti and shawl, a gesture which won the people's hearts, and he became known as Mahatma – the great soul. There are many divergent views about Gandhi's personality and his methods. Perhaps his most important contribution to India's struggle for independence was his spiritual leadership, and his consequent influence over the mass of India's population. All his life he held to two fundamental principles, a belief in Ahimsa, or non violence, and the concept of Satya, or truth; as he said: 'My uniform experience has convinced me that there is no other God than Truth. And if every page of these chapters (of his autobiography) does not proclaim to the reader that the only means for the realization of Truth is Ahimsa, I shall deem all my labor........to have been in vain." "At 4.30 p.m., Abha brought in the last meal he was over to eat; it consisted of goat's milk, cooked and raw vegetables, oranges and a concoction of ginger, sour lemons and strained butter with juice of aloe. Sitting on the floor of his room in the rear of Birla House in New Delhi, Gandhi ate and talked with Sardar Vallabhbhai Patel, Deputy Prime Minister of the new government of Independent India. Maniben, Patel's daughter and secretary, was also present. The conversation was important. There had been rumors of differences between Patel and Prime Minister Jawaharlal Nehru. This problem, like so many others, had been dropped into the Mahatma's lap. Abha alone with Gandhi and the Patels, hesitated to interrupt. But she knew Gandhi's attachment to punctuality. Finally, therefore, she picked up the Mahatma's nickel-plated watch and showed it to him. 'I must tear myself away,' Gandhi remarked, and so saying he rose, want to the adjoining bathroom and them started towards the prayer ground in the large park to the left of the house. Abha, and Manu, the granddaughter of another cousin, accompanied him; he leaned his forearms on their shoulders. 'My walking sticks,' he called them. During the daily two-minute walk through the long, red sandstone colonnade that led to the prayer ground, Gandhi relaxed and joked. Now, he mentioned the carrot juice Abha had given him that morning. 'So you are serving me cattle fare,' he said, and laughed. 'Why should I, since you are my timekeepers?' Gandhi retorted. 'But you don't look at the timekeepers,' Manu noted. Gandhi laughed again. It was only a few yards now to the wooden platform on which he sat during services. Most of the people rose; many edged forward; some helped to clear a lane for him; those who were nearest bowed low to his feet. Gandhi removed his arms from the shoulders of Abha and Manu and touched his palms together in the traditional Hindu greeting. Just then, a man elbowed his way out of the congregation into the lane. He looked as if he wished to prostrate himself in the customary obeisance of the devout. But since, they were late, Manu tried to stop him and caught hold of his hand. He pushed her away so that she fell and, planting himself about two feet in front of Gandhi, fired three shots from a small automatic pistol. Gandhi murmured, 'Hey Rama (Oh, God)' A third shot rang out. The limp body settled to the ground. His spectacles dropped to the earth. The leather sandals slipped from his feet. Diplomats paid formal visits; some wept. Outside, a vast multitude gathered and asked for one last view of the Mahatma. The body was accordingly placed in an inclined position on the roof of Birla House and a searchlight played upon it. Thousands passed in silence, wrung their hands and wept. The procession, two miles long, left Birla House on Albuquerque Road in New Delhi at 11.45 a.m., and, moving forward inch by inch through dense masses of humanity, reached the Jumna River, five and a half miles away, at 4.20 p.m. A million and a half marched and a further million watched. Braches of New Delhi's splendid shade trees bent under the weight of persons who had climbed upon them to get a better view. The base of the big white monument of King George V, which stands in the middle of a broad pond, was covered with hundreds of Indians who had waded through the water. Now and then the voice of Hindus, Moslems, Sikhs, Parsis and Anglo-Indians mingled in loud shouts of 'Mahatma Gandhi ki jai (long Live Mahatma Gandhi)'. At intervals the multitude broke into sacred chants. Three Dakota aircraft flew over the procession, dipped in salute and showered countless rose petals. Four thousand soldiers, a thousand airmen, a thousand policemen and a hundred sailors, in varied colored uniforms and head-dress, marched. Prominent among them were mounted lancers bearing aloft red and white pennants the bodyguard of Governor-General Lord Mountbatten. Armored cars, police and soldiers were present to maintain order. In charge of the death parade was Major-General Roy Bucher, an Englishman chosen by the Indian government to be the first commander-in-chief of its army. By the holy waters of the Jamuna, close to a million people had stood and sat from early morning waiting for the cortege to arrive at the cremation grounds. The predominant color was white, the white of women's saris and men's garments, caps and turbans. Several hundred feet from the river, at Rajghat, stood a fresh funeral pyre made of stone, brick and earth; it was about two feet high and eight feet square. Long thin sandalwood logs sprinkled with incense had been stacked on it. Gandhi's body was laid on the pyre with the head to the north and the feet to the south. In this position Buddha had met his end. At 4-45 p.m., Ramdas set fire to his father's funeral pyre. The logs burst into flame. A groan went up from the vast assemblage. Women wailed. Several personal friends of Gandhi asked for and received pinches of his ashes. One encased a few grains of ash in a gold signet ring. Family and followers decided against gratifying the requests for ashes which came from all the six continents. Some Gandhi ashes were sent to Burma, Tibet, Ceylon and Malaya. But most of the remains were immersed in the river of India exactly fourteen days after death-as prescribed by Hindu ritual. Ashes were given to provincial prime ministers or other dignitaries. The provincial capitals shared their portions with lesser urban centers. Everywhere the public display of the ashes drew huge pilgrimages and so did the final ceremonies of immersion in the rivers or as at Bombay, in the sea. Gandhi's assassination caused dismay and pain throughout India. It was as though the three bullets that entered his body had pierced the flesh of tens of millions. The nation was baffled, stunned and hurt by the sudden news that this man of peace, who loved his enemies and would not have killed an insect, had been shot dead by his own countryman and co-religionist. Never in modern history has any man been mourned more deeply and more widely. The light has gone out of our lives and there is darkness everywhere and I do not quite know what to tell you and how to say it. Our beloved leader, Bapu as we call him, the father of our nation, is no more. Perhaps I am wrong to say that. Nevertheless, we will not see him again as we have seen him these many years. We will not run to him for advice and seek solace from him, and that is a terrible blow not to me only but to millions and millions in this country. And it is difficult to soften the blow by any advice that I or anyone else can give you. 'The light has gone out, I said, and yet I was wrong. For the light that shone in this country was no ordinary light. The light that has illumined this country for these many years will illumine this country for many more years, and a thousand years later that light will still be seen in this country. And the world will see it and it will give solace to innumerable hearts. For the light represented the living truth, and the eternal man was with us with his eternal truth reminding us of the right path, drawing us from error, taking this ancient country to freedom. 'All this has happened. There is so much more to do. There was so much more for him to do. We could never think that he was unnecessary of that he had done his task. But now, particularly, when we are faced with so many difficulties, his not being with us is a blow most terrible to bear. On January 30th, 1948, the Friday he died. Mahatma Gandhi was what he had always been: a private citizen without wealth, property, official title, official post, academic distinction, scientific achievement, or artistic gift. Yet men with governments and armies behind them paid homage to the little brown man of seventy-eight in a lion-cloth. The Indian authorities received 3441 messages of sympathy, all unsolicited, from foreign countries. For Gandhi was a moral man, and a civilization not richly endowed with morality felt still further impoverished when the assassin's bullets ended his life. 'Mahatma Gandhi was the spokesman for the conscience of all mankind.' said General George C. Marshall, United States Secretary of State. Pope Pius, the Dalai Lama of Tibet, the Archbishop of Canterbury, the Chief Rabbi of London, the King of England, President Truman, Chiang Kai-shek, the President of France, indeed the political heads of all important countries (except Soviet Russia) and most minor ones publicly expressed their grief at Gandhi's passing. The Security Council of the United Nations paused for its members to pay tribute to the dead man. Philip Noel-Baker, the British representative, praised Gandhi as 'the friend of the poorest and the loneliest and the lost.' Gandhi's greatest achievements', he predicted, 'are still to come'. Other members of the Security Council extolled Gandhi's spiritual qualities and lauded his devotion to peace and non-violence. Mr. Andrei Gromyko, of the Soviet Union, called Gandhi 'one of the outstanding political leaders of India's whose name 'will always be linked with the struggle of the Indian people for their national liberation which had lasted over such a long period' Soviet Urkraine delegate Tarasenko also stressed Gandhi's politics. The U.N. lowered its flag to half-mast. General Douglass MacArthur, supreme allied military commander in Japan, said: 'In the evolution of civilization, if it is to survive, all men cannot fail eventually to adopt Gandhi's belief that the processor of mass application of force to resolve contentious issues is fundamentally not only wrong but contains within itself the germs of self-destruction.' Lord (admiral) Mountbatten, last British Viceroy in India, expressed the hope that Gandhi's life might 'inspire out troubled world to save itself by following his noble example.' The spectacle of the general and the admiral pinning their faith on the little ascetic would certainly seem to justify the verdict of Sir Hartley Shawcross, British Attorney General, that Gandhi was 'the most remarkable man of the century'. To the statesmen and politicians who eulogized him, Gandhi was at least a reminder of their own inadequacies. In New York, a twelve-year-old girl had gone into the kitchen for breakfast. The radio was on and it brought the news of the shooting of Gandhi. There, in the Kitchen, the girl, the maid and the gardener held a prayer meeting and prayed and wept. Just so, millions in all countries mourned Gandhi's death as a personal loss. They did not quite know why; they did not quite know that he stood for. But he was 'a good man' and good men are rare. My father was a twelve year old boy when the Mahatma died. He tells that nobody ate food that day. Nobody cooked food. People wept, men, women and children all alike. It was like a death in one’s own family. Those with some means, immediately started towards Delhi, carrying with them, ‘chandan’ wood logs, desi ghee and such material as is needed in the funeral. The lives that these two men led speak for themselves. Heredity, parents, family background, culture, traditions and surrounding environment make a person. No individual is a separate entity in herself or himself. Everyone is part of a chain. The will power of the individual is important. The strength of the individual comes from various components described above. Gandhiji and Hitler present two antagonistically different faces of humanity. The above mentioned factors of heredity and environment are the main reasons behind the drastic difference between the two. Gandhi's autobiography is much simple to understand as he has used very polite diction even on unpleasant situations. It contains qualities of simplicity, plainness and directness. His style has no place for embellishments, yet he did not hesitate in using examples and similes to explain the peculiarities of the contemporary personalities like Gokhale, Tilak and Pherozeshah Mehta. He writes "Sir Pherozeshah seemed to me like the Himalaya, the Lokmanya like the ocean but Gokhale was as the Ganga". He also has given other examples like "the Green pamphlet sold like hot cakes', and the advice was as better as poison to me. Gandhi has also used antithetical expressions in writing to give force to his statements as he has written, "Swaraj is for the awakened, not for the sleepy and the ignorant'. In his autobiography there is no confusion or ambiguity in his style as he is very clear about his goal and the path he followed. As Gandhi was shy of speaking, he developed the habit of brevity. He never used redundant expressions. He used words very economically. As a lawyer using direct opinions he made his point and hit the target without being diverted by unnecessary ornamental and flowery expressions. Gandhi wrote his autobiography on political and spiritual matters as well. He was a spiritual personality as he was influenced by the Gita, The Bible, and other literary works like Ruskin's Unto This Last, Carlyle's Heroes and Hero-worship, Tolstoy's The Kingdom of God is within you and Thoroue's Civil Disobedience. So he developed a prophetic style, which is well-pronounced in his statements on Ahimsa, Truth, and Love etc. He insists on the necessity of the purification of self. He writes "But the path of self-purification is hard and steep. To attain to perfect purity one has to become absolutely passion-free in thought, speech and action; to rise above the opposing currents of love and hatred, attachement and repulsion". It was the massage of the Gita that made him feel, like one who is fLFkfr izK- "To conquer the subtle passions seems to me to be harder far than the physical conquest of the world by the force of arms." Hitler's style in his Mein Kampf is turgid and full of blatant prejudices that mislead the readers. It is verbose, difficult to read, dull and the product of thwarted intellectual ambition. So it is full of pretentious tricks of the half educated man. In his Mein Kampf Hitler has fabricated a certain image of his life and has expressed a consistent racial view of the world. The book deals with the imagination that a common man rose from humble yet respectable circumstances and reluctantly abandoned his artistic career in favor of saving Germany from its enemies. Hitler wants to project himself a savior which he is certainly not. All the glimpses of his childhood and adolescence present a psychological data to understand his self serving prejudices. Hitler's rhetorical style in his autobiography is intensely aggressive and propagandistic. The tone is pleading and urgent. It leaves readers gasping for air as it oppresses them with the warnings about the sinister forces of the Jews defiling Aryan blood, poisoning society and destroying the world. It is also overwrought, repetitive, pompous and pretentious. The style is turgid and full of mixed metaphors. The syntax is clumsy and convoluted. There are abrupt changes of direction and dissociated thoughts. Thus the overwrought style of Mein Kampf is a definite psychological frame of Hitler's mind. It is an emblem of thought that expresses his character. "Hitler's mental style reveals several disturbing features: a tendency to rationalize personal failures of weaknesses; a marked preference for aberrant fantasies based on distorted ego projections; a paranoid fear of so thought malignant forces; and a deplorable habit of stating uninformed opinions, based on nothing more than self-serving prejudices, as absolute certainties." The purpose of talking about Gandhiji and Hitler in one article is to highlight two drastically different faces of humanity. When we study the consequences of violence, hatred and racism, our faith in goodness, truth and peace increases. Sectarian attitude does not lead one anywhere. It is only when we see humanity as one powerful flow of energetic current that our vision becomes perfect and correct. Gandhi is the name of goodness that lies within us. Goodness, truth and harmony are fundamental to human nature; these forces are also highly infectious. The very mention of Gandhiji, his life and ideas solves many problems automatically. Quoted by Ashis Nandi, Death of the Mahatma in Timer of Ideas in the Times of India, New Delhi, Wednesday, January 30, 2008, p. 16. Klaus, P. Fischer, Nazi Germany : A New History, Great Britain London, Constable and Company Ltd., 1985, pp. 646-650. M.K. Gandhi, An Autobiography : The Story of My Experiments with Truth, Penguin Books, London, 1982, Introductory page. Louis Fischer, Mahatma Gandhi : His Life and Times, Bhartiya Vidya Bhavan, Mumbai, 2003, pp. 1-13. M.K. Gandhi, An Autobiography: The Story of My Experiments with Truth, p. 453. Klaus, P. Fischer, Nazi Germany : A New History, p. 165.
i thank u for publishing such a heart touching article. Hats off to the person who wrote this! again and again i will read thanku mama i m the fan of ur's ! ! this article is a rotten one. "shook the mightiest empire of his day.." Hitler weakened the british empire more then gandhi. whats wrong with you you cannot just say u know everything because you read the autobiographies..!.rubbish.! and you are no one to compare people...they did their part..
and india is not so glorious and peaceful..and all..as you say..
sry for the rudeness..but it was a bit too much to swallow in this article. Is Gandhi a Mahatma? I am sick of this question. There are two reasons why this question annoys me. Firstly, I hate all the Mahatmas and firmly believe that they should be done away with. I am of the opinion that existence is a curse to the nation in which they are born. The reason why I say so is because they try to perpetuate blind faith in place of intelligence and reason. Secondly I do not know what exactly people understand by the word Mahatma. Even then since the Editor of the 'Chhitra' seems to be so adamant on getting- a reply from me, i have decided to make earnest efforts to answer this question. Generally speaking according to an ordinary Hindu in order to pass as a Mahatma a person must have three things, namely his robe, his character and his particular doctrine. If these qualities are taken as a criterion for judging a Mahatma then in the eyes of ignorant and uneducated persons who took to wards others for salvation Mohandas Karamchand Gandhi can be called as a Mahatma. It is very easy for anybody to become a Mahatma in India by merely changing his dress. If you are wearing an ordinary dress and leading an ordinary life even if you perform extraordinary noble deeds, nobody takes, any notice of you. But a person who does not behave in normal manner and shows some peculiar trends and abnormalities in his character he becomes a saint or a Mahatma. If you put on a suit or ordinary dress and do something, people would not even like to look at you. But if the same person discards his clothes, runs about naked, grows long hair, abuses people and drinks dirty water from the gutters, people fall at his feet and begin to worship him. In these circumstances if Gandhi becomes Mahatma in India there is nothing surprising. Had these things been practiced in any other civilized country people, would have laughed at him. To a casual observer Gandhi's teachings appear to be" very sweet and appealing. Truth and Non-violence are very noble principles. Gandhi claims to preach 'Satya' (Truth) and 'Ahimsa' (non-violence) and people have so much liked it that they flock around him in thousands. I fail to understand why they do so. Is it not a fact that thousands of years ago Lord Buddha gave the message of truth and non-violence to the world? Nobody excepting an ignorant fool or congenital idiot would give credit to Gandhi for originality in this matter. There is nothing new in the pronouncement that Truth and non-violence' are necessary for the preservation of human civilization. There is nothing new that Gandhi has added to/the maxim. As I have already stated that earlier Lord Buddha taught these principles thousands of years ago. Had Gandhi thrown some light over the intricate problems arising from the experiment of 'Truth and non-violence' this would have added luster to his Mahatma ship and the world would have remained under gratitude for ever. World is anxiously waiting for the solution of the two riddles, namely how to uphold the noble principle, of 'truth' and under what circumstances should violence be considered as 'right action'. Lord Buddha preached that attitude towards 'Truth' and 'Non-violence' should be pragmatic. What answer Jesus Christ would have given to this question, unfortunately we have no means to know. Perhaps Pilate did not allow him time enough to answer this question. Has Gandhi answered this question? I do not find it anywhere. If we study his teachings and sermons we find that he is trading on other people's capital. Truth' and 'Non-violence' are not his original discoveries. When I seriously study Gandhi's character 1 become exceedingly convinced that cunningness is more evident in his character than the seriousness or sincerity. According to me his actions can be likened to a base coin. His politeness is like the politeness of Ura Heap, one of the characters in the famous English novel 'David Copperfield'. He has managed to keep himself in the fore front by means of cunning and inherent shrewdness. A person who has faith in his capacity and character faces the reality of life in a bold and manly manner. He has no need to keep a dagger up his sleeve. Napoleon always charged from the, front. He did not believe in treachery and never attacked from behind. Treachery and deceit are weapons of the weak. Gandhi has always used these weapons. For many years he had been declaring himself to be a humble disciple of Gokhale. Thereafter he had been admiring Tilak for many years. Afterwards he hated Tilak also. Everybody knows this. Everybody knows that unless he used the name of Tilak for raising funds he could not have collected 10000000 for Swarajya Fund. Forgetting his personal relation and leaving aside other considerations, like a shrewd politician he attached the name of Tilak to the Fund. Gandhi was a staunch opponent of Christian religion. In order to please the Western world he often quoted from the Bible in times of crisis. In order to understand the working of his mind I have two other instances to quote. During the Round Table Conference he told people, I shall not raise any objection against the demands presented by the representatives of the Depressed Classes. But, as soon as the representatives of the Depressed Classes people placed their demands, Gandhi quietly forgot about the assurances given by him. I call it a betrayal of the people belonging to the Depressed Classes. He went to the Moslems and told them that he would support their 14 Demands if they in turn opposed the demands placed by the representatives of the Depressed Classes. Even a scoundrel would not have done this. This is only one instance of Gandhi's treachery. Nehru Committee's Report was presented in the open session of the Congress for discussion. Some amendments were to be made in the Report. All of you must know about it. Mr.Jayakar was hired by Mr. Gandhi to oppose these amendments. These amendments were very vehemently opposed by Mr. Jayakar and his supporters. This is known to many people. But what were these amendments and why so were these forcefully opposed? Not many people know the background of these amendments. I came to know about the opposition of Jayakar (it is a fact I have no reason to question the truth about it) from people who had opposed the amendments. All this was made known by Pandit Motilal Nehru, and Mr. Jinnah who was betrayed by Mr. Gandhi. The corrections which were proposed to be made in the Nehru Committee Report were suggested by Mr. Jinnah for the benefit of his community. But when Gandhi came to know about it he thought a great deal more had been given to the Muslims by Pandit Motilal Nehru than what he wanted to give originally. In order to humiliate Pt. Motilal Nehru he vehemently opposed these proposals. Hindu Muslim hostility is the result of this deceitful action on the part of Gandhi. The man who was considered to be a friend of the Untouchables and the Muslims betrayed the cause of the very same people whose cause he claimed to champion. This immensely pained me. There is, an old saying which befits the occasion (Bagal men chhuri Munh men Ram Ram); 'God's name on the lips and dagger under the arm'. If such a person can be called a Mahatma, by all means call Gandhi a Mahatma. According to me he is no more than a simple Mohandas Karamchand Gandhi. I have given more than what the Editor of the 'Chittra' demanded. I must have told a great deal more than what the readers of the Chittra can digest. Apart from the incidents quoted herein there are two more things that I shall tell and then close. Gandhi's age can be called as the Tamo Yug' of India. Gandhi was the man responsible for eliminating morality from politics and instead introduced commercialism in Indian politics. Politics has been denuded of its virtue. "When the salt has lost its savor, wherewith ye shall salt it" asked Jesus Christ of the Pharisees. How to get rid of the pernicious saintly idiosyncrasies of Gandhiji in Indian public life is the second and most important question. If the Hindu India does not realize it today it will take a long time to retrace its steps. Majority of the Indian population is illiterate, ignorant and uncivilized. This may not be the fault of the people. The privileged few of the society have deliberately kept the masses ignorant and illiterate. As a matter of fact it is impossible to fight against the Mahatma on the strength purely of logic and rationalism. It is fight between intellectualism against miracles and idiosyncrasies. Reason alone cannot wipe off the hypnotic effect of Mahatmic miracles. In these circumstances I would like to offer some suggestions. In order to put an end to the activities of the Mahatma other Mahatmas should come forward to take active part in Indian public life and set up a political wing of their own. There is no dearth of the Mahatmas in India. Upasani Buva, Dada Maharaj, Mehar Baba, Narayan Buva Kedgaonkar are some of the famous names. Numerous saints and 'Mahatmas' are present in India. They know the art of befooling and ensnaring the innocent people. True, the number of their followers is far less than the followers of Gandhi but their incapacity or lack of ability alone cannot be the reason for that. They have the ability and the strength to attain freedom along with the Salvation for their Hindu masses. There are many reasons why they have not been able to know this. Owing to his dual policy and duplicity of character Gandhiji was able to succeed in creating a following by promising to attain spiritual and political liberation for all. I believe that if Upasani Baba, Narayan Maharaj etcetra adopt the methods of Gandhiji undoubtedly they too would be able to establish the wing which can effectively face the blind followers of Gandhi. In this lies India's salvation. Having a number of parties in the country will be beneficial to this country at least for the time being. If an organization is set up with these aims and objects it would be able to serve the same purpose as was served by the Apsaras of the Puranas namely the annihilation of their adversaries. And if this does not happen and this organization remains reactionary even then its existence would be useful. In this way at least the pernicious creed of Fascism which is spreading its tentacles all around will be stalled. I believe that if a Mahatma comes and places his Manifesto stating in a straight forward manner that he can achieve Salvation perhaps India will attain intellectual liberation. This is not a joke. This is no vilification or criticism of anybody. I am writing it with all the seriousness that I can command. Will the Hindus by changing the minds of the Mahatmas like Dada Maharaj, Mehar Bawa or Narayan Bawa try to serve India? We heard about Gandhi's death on that fateful day even though we were thousand miles away in our small village over the radio. We all , young and old, became sad -very sad indeed. Yes, he was indeed a human yet extraordinary man whose life and thoughts must be studied by every man for guide oneself as a moral compass..
Gandhi was only human. The beauty of his life lies in the fact that a mere human could achieve so much. His life speaks for itself. Gandhi's critics are his life-lines. So is true of all critics. Ambedkar had suffered a lot. That suffering was a part os his being. But if we go by his logic, no one can sympathize with the downtrodden simply because in the end it would be proclaimed, 'You're not one of us.' To doubt Gandhi's sincerity regarding social eqality is futile. The only time Gandhiji raised his voice before Ba was when she had refused to clean her own toilet. Gandhi's life is his only message. The phenomenon of reverse-racism has been deeply studied in the American context; in the Indian context it needs further investigation, analysis and commentary. "I must expose the efforts of the Congress and Mr. Gandhi to improve the lot of the Untouchables for the information of the Untouchables and also of the foreigners whom the Congress had deluded into accepting its side by misrepresentation of facts. Besides the difficulties arising out of the fact that the book was already in proof form, this wan a tall order and appeared to be beyond me having regard to other claims on my time. He would not, however, give way and I had therefore to accept his plan. The original work which would have been about 75 pages in print had to be completely recast and enlarged. The book in the present form is a complete transformation. It records the deeds. of the Congress and Mr. Gandhi from 1917 to date in so far as they touch the problem of the Untouchables. Much is written about the Congress, far more about Mr. Gandhi. But no one has so far told the story of what they have done about the Untouchables. Everyone knows that Mr. Gandhi values more his reputation as the saviour of the Untouchables than his reputation as the champion of Swaraj or as the protagonist of Akimsa At the Round Table Conference he claimed to be the sole champion of the Untouchables and was not even prepared to share the honour with anyone else, I remember what a scene he created when his claim was contested. Mr. Gandhi does not merely claim for himself the championship of the Untouchables. He claims similar championship for the Congress. The Congress, he says, is fully pledged to redress the wrongs done to the Untouchables and argues that any attempt to give political safeguards to the Untouchables is unnecessary and harmful. It is therefore a great pity that no detailed study of these claims by Mr. Gandhi and the Congress has been undertaken so far. With the Hindus who have been blind devotees of Mr. Gandhi this study, although it is the first of its kind, will not find favour: indeed it is sure to provoke their wrath. How can it be otherwise when the conclusion arrived at is " Beware of Mr. Gandhi" ? Looking at it from a wider point of view, there is no reason for the Hindus to be enraged about it. The Untouchables are not the only community in India which thinks of Mr. Gandhi in these terms. The same view of Mr. Gandhi is entertained by the Muslims, the Sikhs and the Indian Christians. As a matter of fact, the Hindus should cogitate over the question and ask: why no community trusts Mr. Gandhi although he has been saying that he is the friend of the Muslims, Sikhs and the Scheduled Castes and what is the reason for this distrust ? In my judgment, there cannot be a greater tragedy for a leader to be distrusted by everybody as Mr. Gandhi is today. I am however certain that this is not how the Hindus will react. As usual, they will denounce the book and call me names. But as the proverb says: "The caravan must pass on, though the dogs bark." In the same way, I must do my duty, no matter what my adversaries may have to say. For as Voltaire observed: Who writes the history of his own time must expect to be attacked for everything he has said, and for everything he has not said : but these little drawbacks should not discourage a man who loves truth and liberty, expects nothing, fears nothing, asks nothing and limits his ambition to the cultivation of letters." The book has become bulky. It may be said that it suffers by reason of over-elaboration and even by repetition. I am aware of this. But I have written the book especially for the Untouchables and for the foreigners. On behalf of neither could I presume knowledge of the relevant facts. For the particular audience I have in view, it is necessary for me to state both facts as well as arguments and pay no regard to the artistic sense or the fastidious taste of a cultivated and informed class of readers. As it is my intention to make the book a complete compendium of information regarding the movement of the Untouchables for political safeguards, I have added several appendices other than those of statistical character. They contain relevant documents both official and non-official which have a bearing upon the movement. Those who are interested in the problem of the Untouchables will, I believe, be glad to have this information ready at hand. The general reader may complain that the material in the Appendices is much too much. Here again, I must state that the Untouchables are not likely to get the information which to the general reader may be easily accessible. The test adopted is the need of the Untouchables and not of the general reader. One last word. The reader will find that I have used quite promiscuously in the course of this book a variety of nomenclature such as Depressed Classes, Scheduled Castes, Harijans and Servile Classes to designate the Untouchables. I am aware that this is likely to cause confusion especially for those who are not familiar with conditions in India. Nothing could have pleased me better than to have used one uniform nomenclature. The fault is not altogether mine. All these names have been used officially and unofficially at one time or other for the Untouchables. The term under the Government of India Act is 'Scheduled Castes.' But that came into use after 1985. Before that they were called 'Harijans" by Mr. Gandhi and 'Depressed Classes' by Government. In a flowing situation like that it is not possible to fix upon one name, which may be correct designation at one stage and incorrect at another. The reader will overcome all difficulties if he will remember that these terms are synonyms and represent the same class. I am grateful to Professor Manohar Chitnis for the preparation of the Index and to Mr. S. C. Joshi for help in correcting the proofs."